Located in New Orleans/Lafayette, La. I will build any guitar that your imagination or mine will allow. 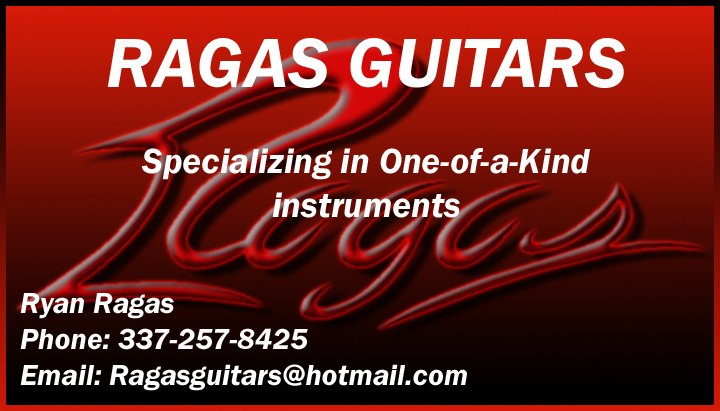 Any body shape, headstock shape, inlays, custom tuner and volume knobs, carvings, etc... I will design a guitar for you, with you or use your own designs, no idea is too crazy for me. Charges are based on an individual job (Not as expensive as you think considering the type of work I will do). Contact me for pricing either by email, AOL Instant Messenger screen name "Powerguitar", or phone (Anytime that's good for you to call is good for me, and I do mean anytime). I am currently working for another guitar company as a tooling engineer so if you want some work done it will take a good bit of time to build. Please be patient, its not easy starting a business without money. I am currently a UPS driver, which means a lot of time to save money to start full time guitar building, not a lot of time to actually build. My band LAY TO WASTE has 2 mp3s posted at www.myspace.com/laytowaste check it out, 5 song demos might be for sale in the future.